Please note opening hours are subject to change from week to week based on seasonality and exclusive bookings. With a sharp focus on Irish, locally sourced produce, the Brasserie is a refreshing addition to the Grand Canal restaurant scene. 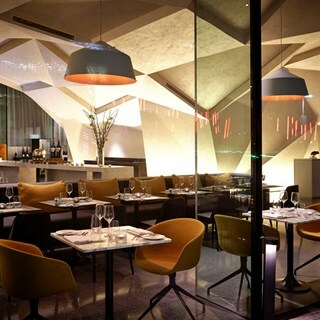 A space of elemental light and energy that transforms seamlessly from day to night. 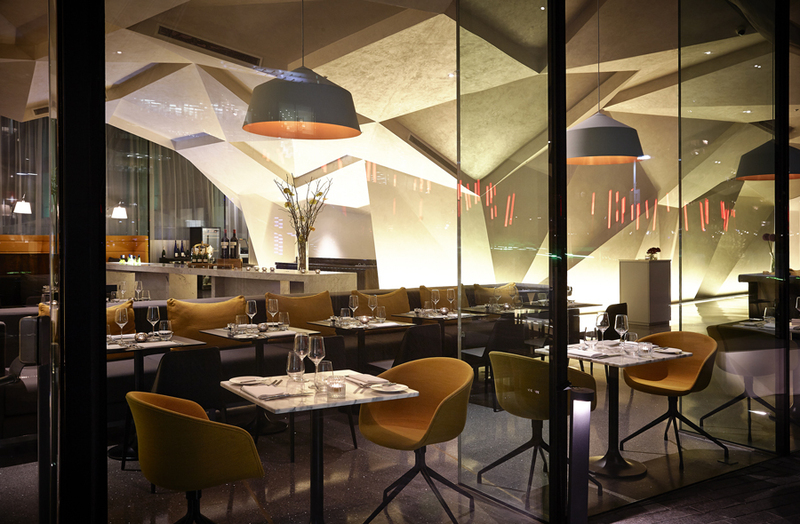 The stunning geometric ceilings animate the light filled Brasserie to create a fresh, modern restaurant with a firm emphasis on design. The Brasserie is a destination for food lovers who love to try something different, yet share a passion for discovering simple, unfussy dishes made with locally sourced ingredients that let the food speak for itself. Food was lovely, service was great. For me, I understand lamb is usually served medium rare, on this occasion I asked for it to be cooked medium to well and it was absolutely perfect. So refreshing to have the chef facilitate this request. The whole meal was truly delicious. We visited in January and said we would be back. Not only are we looking forward to our next visit but have told our family and friends about our wonderful experience this weekend in The Brasserie. Have eaten here quite a few times (pre-theatre menu) and have never been disappointed with the service or food but would like to try the a la carte sometime. The pre-theatre menu was excellent. The staff were helpful, well informed and very friendly. We will definitely dine here again on our next visit to Dublin. We will definitely recommend this restaurant to our friends and colleagues. I had bought a voucher for very close friends for their 50th wedding anniversary. They absolutely loved the food and the service they said was amazing... When they paid with the voucher there guy who was taking the payment saw that it was for their  anniversary and returned with a dessert to share with 50th wedding anniversary on the side .. which was a lovely gesture.. couldnt fault the service from the time I had originally emailed the hotel asking about purchasing a voucher.. Really lovely spot . The service in the restaurant for the pre theatre menu was excellent. I didn’t get the waiters name but he was very attentive and very friendly. We really enjoyed our experience here and will be back. We were very impressed with our pre theatre meal. Lovely food and great service. Our waiter was Mark who made us feel very welcome. Lovely meal, great service- but would have been even better with live music. Before going to dinner I asked about to the roof bar. I was told there was no problem, we did not need a reservation just walk up when ready. Later, when we tried to do so, we were asked if we had a reservation. I said no, we were told we didn’t need one. Well, apparently we did... so we didn’t get a drink after dinner as after that I wasn’t going to sit downstairs. You staff let you down last night - I won’t be in a hurry back. I booked a table for 6pm for a pre theatre meal and specified that we needed to be out for a show at 7.30pm. We arrived on time. When we arrived we were given 2 menus even though there were 6 of us. We had to ask for more. The starter came promptly and we had no complaints about it. However there was no bread placed on our table which we subsequently noted was placed on tables all around us. There was a significant delay in getting our main courses. After enquiring about them they came just after 7pm with some explanation that the chef was not happy with the steaks. We had to rush to eat the main course (which was fine), and had to request the bill as we were eating it. We had no time for dessert or coffee. It was most disappointing for what was to be a relaxed family night out. Some of the group had travelled for two hours to get there on time. There was a general sense of lack of organisation with staff rushing and not really looking like they knew what was next. I would be reluctant to recommend the brasserie to anyone for pre theatre or in general unless they are willing to sit around for unusually long periods. We had a lovely afternoon at Le Drunch, food was great and good value except we thought the price of coffees at €4.50 was very expensive, especially in comparison to the price of the food. Service was friendly but not particularly efficient, certain parts of our order were missed but this was rectified quickly. Overall a good experience. The food was adequate, although the portion size was quite underwhelming. What annoyed most was the price! Beautiful lunch for Mother's Day, my Mam thoroughly enjoyed! This is the 2nd time we’ve been disappointed with the service here. They just cannot cope with the numbers for the pre-theatre menu. The last time we had to leave just as our desserts and coffee were served so this time, we allowed extra time and arrived at 5.20pm, thinking we would have plenty of time (just over 2 hours) to relax and enjoy the meal. Again, although we ordered in plenty of time, we were so long waiting, we didn’t get to finish our food. We had to stand with our coats on and queue to pay. Another couple beside us were so long waiting for their main course they had to leave. In fairness to the staff on duty, they worked really hard but unless the Marker can allocate more staff, they really should not offer this service. €120 for 2 people (3 course meall with a glass of wine each) the last hour of which was spent desperately trying to get service. We won’t make this mistake again! We attended the “Lopez de Haro, Rioja Wine Dinner” at the Marker on Wed 27th March and it was a truly wonderful evening! From beginning to end, the evening was run professionally and friendly, beautiful food accompanied by stunning wines! Fantastic all round - many thanks! Service was very slow and considering it was a pre-theatre meal and sitting, that was very surprising. We arrived at 6pm sharp for a 2 course meal and had to run to make the show at 7.30pm and left most of our deserts and coffees which were disappointing. Despite the staff being friendly, they didn't seem conversant in the menu and I received the wrong dish, and an extra portion of another dish that was ordered (two mistakes on the order). I had to wait for the right one (a poke bowl), and honestly it was not at the level I would have expected in terms of presentation and quality of the fish. It also took us 20 or so minutes to receive the coffee we had ordered.